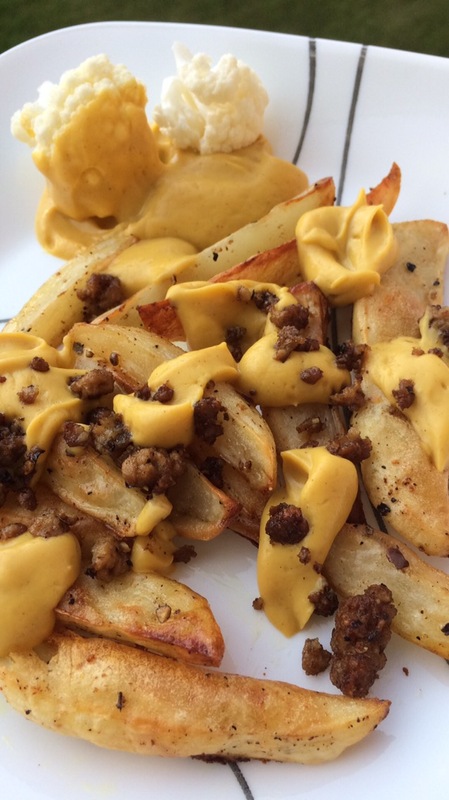 Fries loaded with Queso and burger crumbles and it’s 100% vegan! Yes I did and I have no regrets! This recipe can be made using your stove, you would need to modify the recipes. For the Queso you’ll need to visit Kathy Hester’s blog Healthy Slow Cooking. If you don’t have a instant pot, boil the nuts and carrots for about 5 mins, add cauliflower and cook for about 5 more mins. You want them on the softer but not mushy side. Note* I have not tried this method so I’m guess here. As you know the bigger the pieces the longer it takes to cook. 4-5 potatoes, peeled and cut into wedges. 1/2 tsp ancho powder or any chili powder you like. 1 tablespoon of oil or omit for oil free cooking. Toss the wedges with the oil and seasonings. Place in air fryer, cook at 180 for 15 mins, flip and cook for 10 more mins. For oven method, pre-heat oven to 350 and cook for 40-45 mins. 1 tsp oil or omit for oil free cooking. Toss the crumbles with the oil and seasoning right in your frying pan. Cook on medium heat until heated through about 5-8 mins (I didn’t time it). Let me know what you think. I hope you like it! Posted on August 4, 2017 by BrandiePosted in Food PornTagged beyond meat, fries, Queso, Queso burger fries, salad not salad, vegan, what vegans eat. Ooo what a great pland-based meal everyone will love! It’s pretty good 🙂 Replace the fries with nacho chips for an extra treat! Thanks 🙂 Queso is all the rave here. I’m just trying to veganize things. Let me know what you think.